In just a month, you can certainly put things in perspective. Actually, you can adjust your perspective in one day, but I think you know what I mean. March 2009 was a really bad month for the US. The stock markets were bottoming out. The Tea Party was ‘founded,’ just weeks prior. And President Obama failed to learn that he had to be a much bolder, offensive leader in order to be successful. He was going to get fair criticism from most beltway pundits, but he was never going to be fairly treated by the Right-wing media. Every business trip has been labeled a vacation. Every speech has been called either an exercise in ego, an abuse of power, or both. 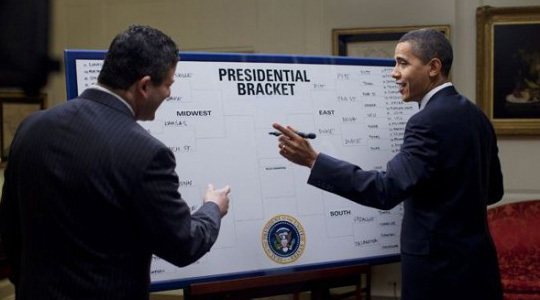 And even taking time during a weekday lunch break to fill out NCAA tournament brackets has been criticized as an abuse of government time. Obama had to be educated enough to know that when you are a Democratic president, and therefore portrayed by the right wing media as illegitimate, you are not going to be granted the same leniency given to a Republican predecessor. George W. Bush took 977 leisure days (I won’t call them vacation days) while in office, while Barack Obama is being flamed for playing 60 rounds of golf in 26 months. A high number, yes. But keep in mind that Bush went to Camp David every weekend during the chaotic autumn of 2001, partly so he could watch college football games and chomp on pretzels with NSA Secretary Condoleezza Rice. No one accused national security being “off duty” on weekends. But I meant this post to be about sports. The state of the world can go up as a separate post. And, well, this brings me back to where I started. March. Yes, March 2009 was really bad. Our economy was on the edge of an abyss (and isn’t far from the edge still today). But here we are, two years later, and this March has been so eventful, I really am hard pressed to find another month so significant in world history since August 1991 – nearly 20 years. Or if not significant, then at least a period more eventful since that amazing summer of 1991. I was trying to get this post up in March. Working seven days a week, it was more difficult than I assumed. So while it is late, here is my random, eccentric summary of some of the sports happenings I witnessed in March. Need I say more? It’s going to be awful. I see a team with a weak offense, an almost non-existent bullpen, and in dire need of a complete financial takeover. New ownership and a new GM are sorely needed. And yet, I am scheduled to go to three games and counting this season. The Mets are my local MLB team. I like them and their windy, trashy, pinball machine of a ballpark called Citi Field. They are a big market team. They will eventually mount another playoff run…if Atlanta and Philadelphia ever relinquish their dominance over the NL East. Oh, and that new ballpark in Miami is just 12 months away from opening. And the Marlins already have as many MLB championships as the Mets. Sigh. Tired of the Red Sox being called the best team in baseball? I am. They have incredible depth. They have so much depth, they had to send young players who are almost ready for the majors back to Pawtucket. They don’t just have a veteran situational lefty reliever, they have a new lefty, Andrew Miller, who could be an all star in waiting. But Red Sox Nation needs to get back to its logical roots. Andrew Miller is not yet available, as much as he might be needed later this season. David Ortiz is having a great start, but he needs everyone else in the order to catch up. And the starting pitching, so far, has been far short of expectations. It has been 15 years since the Red Sox started the season 0-4, but that is what has happened as this long delayed blog post went up. Discipline problems. Only one point in ten games. A predictable, yet worse than expected loss to Stoke City. The only thing holding Newcastle United together in March was positive team chemistry, consistent fan support, and faith that the team would notch the 1 or 2 wins needed to secure safety in the Prem. More on that in a future post. The ICC Cricket World Cup was a cracker this time around. News of the death of the 50 over game are premature, if not exaggerated. I love 50 overs per side. Cricket is a pastime. The ideal one day match should be eight hours, like a work shift, except it isn't work. We saw England beat the West Indies by a narrow margin, with the hope of going all the way, only to be beaten down by semi finalists Sri Lanka. And in that West Indies match, the Windies had to use a batsman out of order because another batsman was in the “washroom” when his turn to bat came up. It’s a silly sport. I love it. Dallas Mavericks: One player short of a championship? Or two. It's a shame that the team with the best coach and defense in the NBA seems to be too broken to advance in the upcoming playoffs. I hope I am incorrect. Seriously, who manufactured this spectacle? Oh right, the NCAA and CBS, with CBS paying the NCAA billions of dollars to televise the tournament for decades, and fans paying billions of dollars into an underground betting economy. Somehow you are not a real man unless you have something called a bracket. Meanwhile, the NCAA, which apparently is a non profit organization, issues death penalties to teams (see U Mass, 1996) if one player accepts gifts from any source. No disputing the punishment. But what exactly does the NCAA do with the partially-disclosed billions it receives, besides not paying the athletes who draw television audiences? Is it silly to ask? Of course, Europe has its own equivalent of the NCAA tournament. It is called the Football Association and the English Premier League. But since I am able to separate gambling in the UK from the beautiful game, I can appreciate the sport. What I can’t appreciate is a street game, played by college students, elevated to something it never deserved. The only people who truly care about college teams are college students. I can attest. That 1991 U Mass squad that made it to the NIT Final Four was brilliant. But would anyone seriously outside U Mass in the early 1990s remember that? Would Boston, a pro sports town, really care about college sports, aside from the occasional BC football game or the Beanpot? No. While I am not one to put any faith into professional sports as a wholesome, socially necessary institution, I am never going to care about the cash flush NCAA, or it’s hypocrisy on gambling and gifts, while it receives billions in cash from the media, big universities, and who knows who else.